Now Available at the WTF Gift Shop! Ah, the gentle, reassuring glow of the nightlight. When we think of the nightlight, we think of that thing which makes children feel safe at light, which banishes dark thoughts, which creates a snug and comforting home. Usually this is true, and nightlights are seen as innocuous as a They Might Be Giants song. And I quote: Not to put too fine a point on it, say I’m the only bee in your bonnet. Ohhh, it’s sweet, it’s charming! A nightlight is the kind of thing that gives warm-fuzzies! With that in mind, we at the Museum of WTF proudly present…. 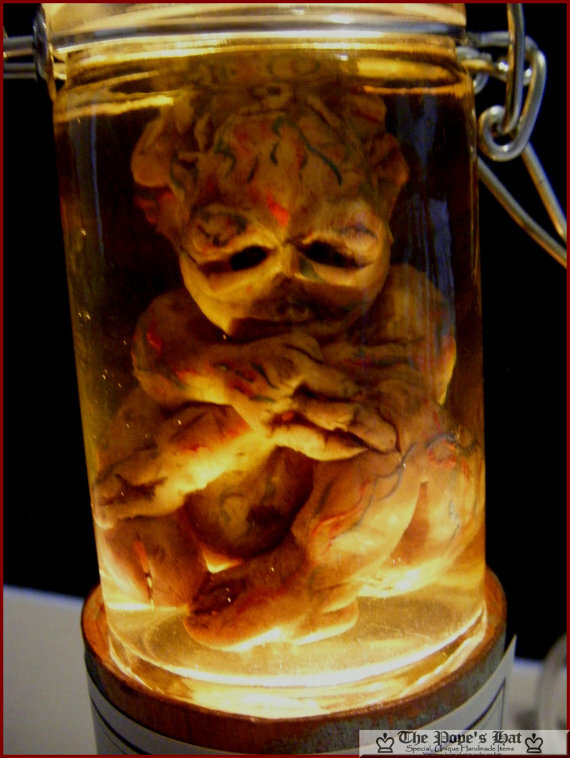 The Alien Fetus Specimen Jar nightlight. We shall watch you in the darkness.